We recently had an event at work that required I do a different job, work much longer hours, and not leave the building during work hours. I rose up to the challenge, albeit a bit anxious about the whole thing, I learned a heap and always came home absolutely exhausted. Yet I would return to work bright and early and ready to tackle another day. I'm back now! Back to normal hours, my usual job, and the free time that I used to have is also back! What's that noise? That's me cheering so loud you can hear it from where you sit! Anywho, when I came back to the blog to see what I could post today, I found that the names of these two Indigo Bananas polishes were quite suitable for my recent past and the present. Do Your Duty as described by the brand is a dark blue/blackened blue linear holographic. 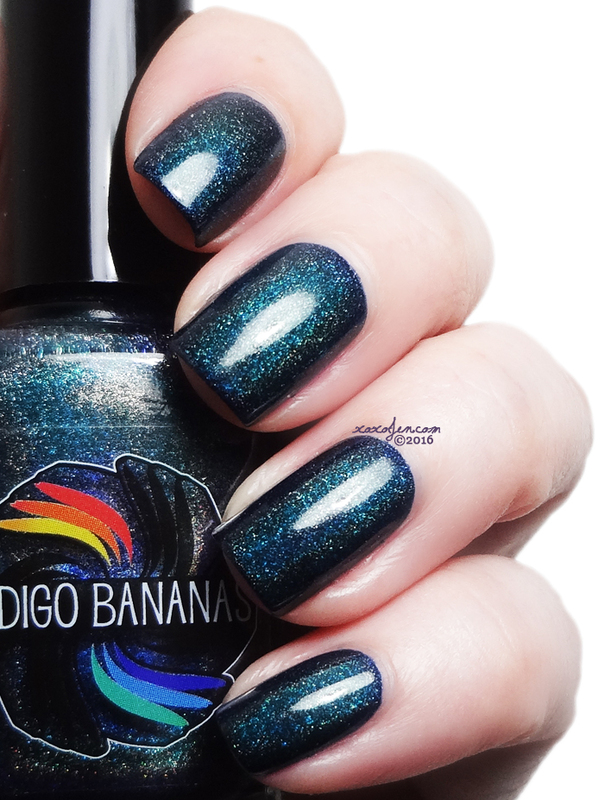 It is much darker than other Indigo Bananas holos, but not near-black nor inky (compared to Night Gathers, which is an inky black). The holographic flame gives this polish the illusion that it is more blue leaning than it is. I wore two coats to insure it was opaque for photos, but I strongly believe it only needed one good thick coat. Absolutely stunning in sunlight and still holo indoors. The formula was fluid and fantastic to apply. Cherry Blossom Roads is what I'm hoping my future will be like (after I catch up on work left undone of course!). Pink, full of happy colorful shimmers and warm weather joy! I wore two coats and topcoat for an opaque look. The formula was good and easy to apply. 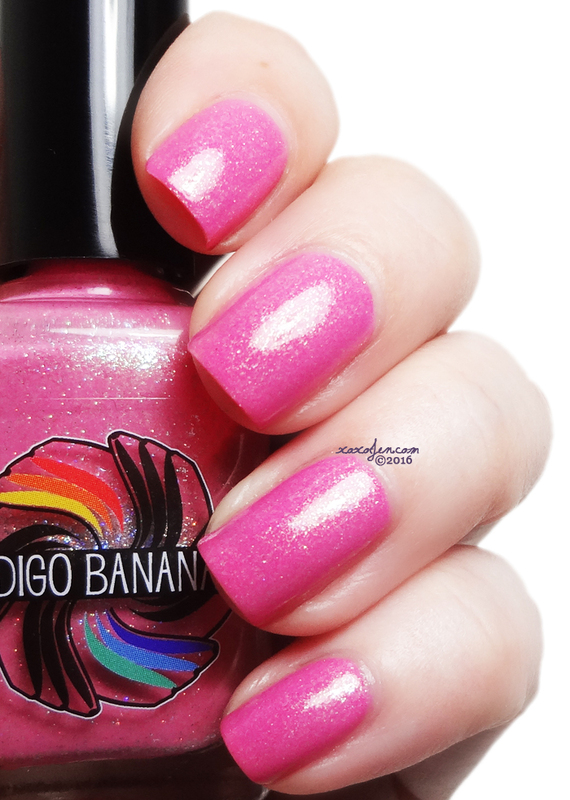 Both polishes and many more pretty ones are available online at Indigo Bananas. Wow, that Do Your Duty is stunning! I like the pink also... but that teal/blue holo, Wow! It looks great on you, btw. Whew! Glad you got your special duty work over and done with - and now have time to blog again. Even though I liked my work, I always felt I was let out of prison when I was finished with such projects. Normal was very so sweet! Thank you! I just love a vampy holo! And omg yes, you totally get it about work! I am so relieved that things are back to normal.